Current version of SCARM does not have dedicated figure for making a precise 2D circle / 3D cylinder. Using of the Polygon figure for this is not always giving good results. However, even now, there is a way in which you will be able to make nearly perfect circles / cylinders for reproducing various circular objects in SCARM. In short, we will use several identical rectangle figures, rotated by specific angles to make the needed circular shape. Before you begin, take a look on How to work with figures FAQ topic in the documentation, if you were not acquaint with it. 1. Make a Rectangle figure. Shape it to be a narrow horizontal rectangle with long side to be equal to the needed diameter of the circle and short side to be 1/5 of the diameter. I.e. if you need a 125mm (~5″) circle, make the rectangle to be 125mm x 25mm (5″ x 1″). 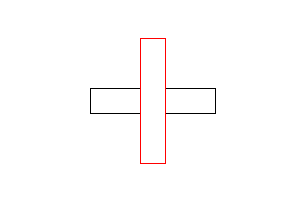 To draw a Rectangle figure, click on its button in the selection panel, then click and hold left mouse button on the drawing plot, drag to form a rectangle and release the button when ready. See the dimensions in the status bar while shaping it. Leave the Properties unchanged for now. Here is how the first rectangle should look. 2. Select then copy and paste the rectangle. While still selected, rotate it at 90 degree, using “Objects” > “Rotate” menu command. You can directly click over “90″ or “-90″ degree marks in the Rotate dialog box. Now you will have a cross figure. 3. Select the cross figure, then copy and paste it. While still selected, rotate it at 45 degree. The result should look like below. 4. Again, select the whole figure, then copy and paste it and now turn the selection to 22.5 degree. To make precise rotation up to a quarter degree, use the Up/Down arrow buttons next to the current degree indicator in the Rotation dialog box. 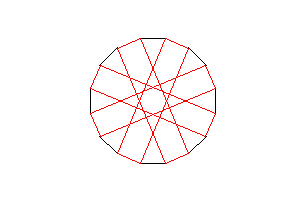 The outer perimeter of the result shape now should look like a real circle. 5. Select the whole figure and open the Properties dialog, using “Objects” > “Properties” menu command. Give it the needed Vertical Position and Height parameters in order to produce 3D standing cylinder and change the color to match your needs. You can also group all the rectangles together for better handling, i.e. moving or copy/paste procedures. Now you will have a circle build from rectangles in 2D and a pretty good cylinder in 3D. 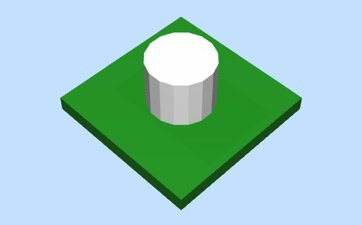 If you decide, you can make the short side of the rectangle to be 1/10 of the long side (diameter) and with one more Copy/Paste/Rotate (at 11.25 degree) commands, you will get a much smoother cylinder like the right one below. 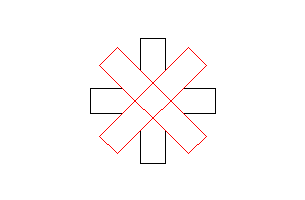 Native Circle figure is now available in SCARM, starting from version 0.9.25. This entry was posted in Outdated Topics and tagged circle, custom, cylinder, figure by Milen Peev - Author of SCARM. Bookmark the permalink.